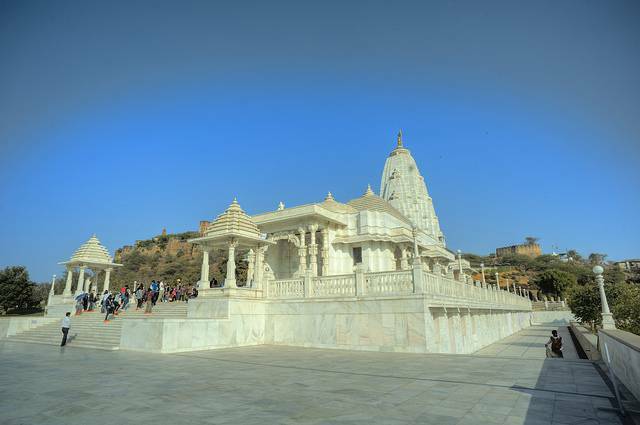 The Birla Temple in Jaipur is one installment of the many noted Birla temples around the country. Built in 1988, this temple looks almost enchanted when illuminated at night. It is constructed of the finest white marble and is often rightfully cited as a modern architectural marvel. Both the exterior and interior white marble panels depict mythological themes and scenes, and quotes from the Bhagavad Gita and the Upanishads. Also known as Laxmi narayan Temple, as it is erected in memory of Lord Vishnu (Narayan), the preserver. In the vicinity of the temple there is a museum that displays some ancestral possessions of the Birla family, apart from a wellmaintained garden that provides a serene and refreshing atmosphere to its visitors. A shopping complex is also located here, with a plethora of memorabilia to choose from.